I never believed it to be a provable clothes sharing event, but I was proven wrong with this project. The charcoal hoodie has become Supernatural legend. It has spawned practically a whole genre of fanfic in and of itself, and at the very least has made the idea that Dean wears Sam's hoodies when he's sick widely accepted fanon. As for the hoodie itself: it's charcoal black and cozier than Sam's regular hoodies. Since Dean is actually wearing it in it's first appearance, there's still room to debate on ownership - but I think, logically, it must be Sam's, since Sam is the one who wears the hoodies in the family. The Charcoal Hoodie appears first in Faith (1x12). Dean wears it home from the hospital, and keeps it on for the trip to Nebraska and his healing. As soon as he is feeling better, he takes the hoodie off. 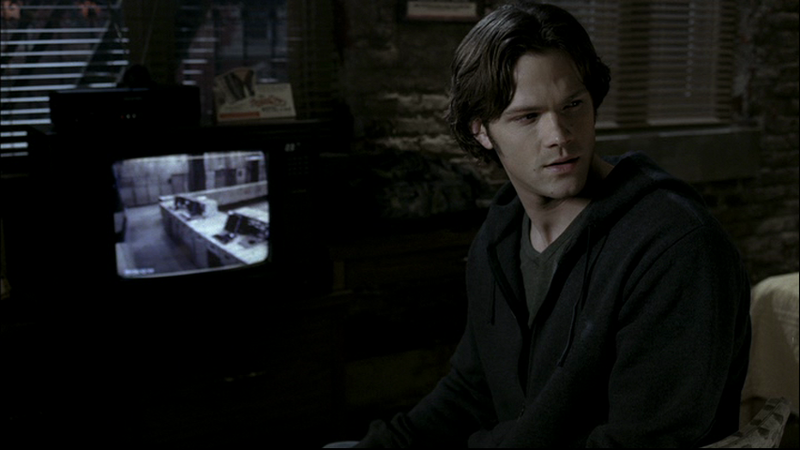 In Nightshifter (2x12), Sam wears a charcoal hoodie after he and Dean return to the motel room to review the tapes that Sam confiscated from Ronald. It is the only scene Sam wears it for. FATE: Perhaps it was lost somewhere in their travels or perhaps it still lies somewhere in the bottom of a duffle bag waiting for the day Dean needs it again. There has to be a special place in heaven for the total nerds who track stuff like this AND THEN SHARE IT WITH THE REST OF FANDOM! Thank you! Look forward to whatever else you research! Haha! Thank you for appreciating my insanity! Oh man, I know! JA and the make-up department did an outstanding job making Dean's illness so realistic. I always feel sort of bad for finding him so amazingly attractive in this episode, but DAMN...even while looking like death warmed over, JA REALLY looks good in a hoodie. Yes, he's on my shortlist too! I don't have your perspective, but it really wasn't until I started realizing how good JA was at body language and facial expressions that I realized how sucky other actors were at them. And I agree, it was really around this episode (that and the phone call to John in Home) that completely sold me on JA (and Dean) being totally awesome at his job. Yeah, I think JP has really improved by leaps and bounds BECAUSE he acts with JA! I mean, I love JP to pieces, but especially at the beginning of the series, you can tell there's a huge difference in ability between the two of them. You know that JA knows how important it is too, because when he talks about "The End" he talks about how he got his stuntman to fill in for the "other Dean" because he "knows how to move like Dean." And yes, SKIN is AWESOME! Yes, I'm a rare Jared-fan who will actually acknowledge that he was a puppy out of the gate at the beginning of the series, and has really been growing in ability since...it kind of drives me crazy when fans believe that just because they like an actor, that actor can't have any faults and has to be the best actor in the world. :P But yes, I totally agree about JP finally hitting his stride in S5-S6...not that he was horrible before, just that he still had a lot of room to grow. I definitely think Supernatural really lucked out with their two leads - if they had gotten more wooden/less-talented actors, I doubt the writing would be enough to carry it as far as it's gone. Yes, I think one of the great things about JP is that he was willing to learn - that he KNEW he was untrained and not-perfect and could improve greatly...and I like that about him. You can tell he's really trying to constantly improve...I mean, a lot of people on a long-running series could just phone it in, but neither JP or JA seem to take the standpoint. As much as I love having Jensen on the show - I often feel like we're stealing him away from the movies he SHOULD be doing :P But then, who knows if anyone is smart enough to hire him - the movie industry is kind of a stupid place where talent doesn't seem to matter 90% of the time. JA was the better actor when they started. I think the boys are about equal in ability now. Sadly, J.A. has definately aged better. Sam lost all of his baby softness, and I don't think He's so cute with out it. That Said, I'm a total Sam girl. I understand his intensity of Character better, because I'm the same way: Utterly driven. I'm also liking Dean Better the secondtime around Than I did the first time I watched the show. Sadly, J.A. has definately aged better. Sam lost all of his baby softness, and I don't think He's so cute with out it. Thankfully, that's a matter of taste - and while I agree that JA has aged very well. I think J.P. is better looking now without the baby-softness. But, I've always liked my men with harder lines. And I agree, the boys are totally equal in ability these days. 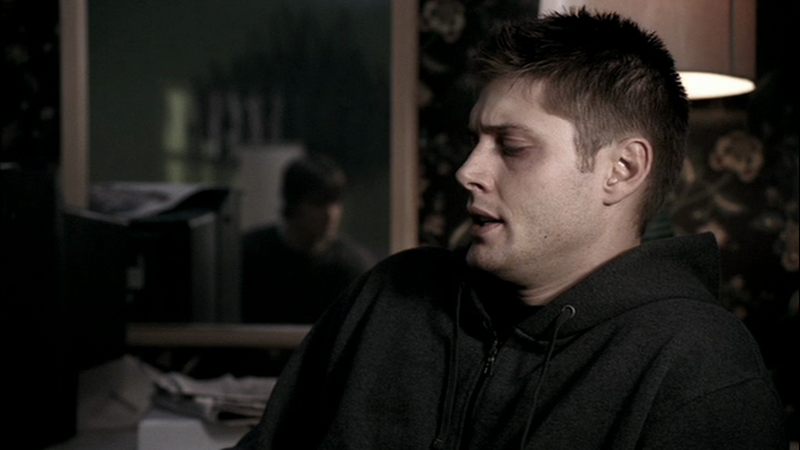 "..the idea that Dean wears Sam's hoodies when he's sick.."
Hey, just followed a link in from SuperWiki. And it totally made my day there is proof it is Sam's hoodie! Well, I take it as proof anyway. As you say, Sam wears the hoodies in the family, and it fits Sam just right whereas it looks too big on Dean. WHICH IS A BIG PART OF THE REASON HE LOOKS SO IRRESISTABLY ADORABLE IN IT!!! Thanks for doing this. Perfect timing too, because Faith is next up in my rewatch of the entire series, and now I will appreciate it all the more! I'm off to read the rest of the clothes entry. Man, he DOES look irresistibly adorable in it! And I also take it as proof that it is Sam's hoodie, even though Dean wears it first. I'm glad you stumbled across this entry before you rewatched the episode! That's fun. :) I'm glad I could contribute to your rewatch-entertainment! Thanks! I'm being a bit slow to post S7, but it'll be up in the next month or so. I've got it all on my computer, I just have to take the time to update the site.